The advantage of Robust Detail FFT3 Resilient Composite Batten systems is that services can be installed between battens. However they must not bridge the resilient layer on the battens. FFT3 resilient composite battens must be overlaid with an 18mm (min) tongued and grooved board. This is usually chipboard but can be plywood or engineered hardwood flooring. 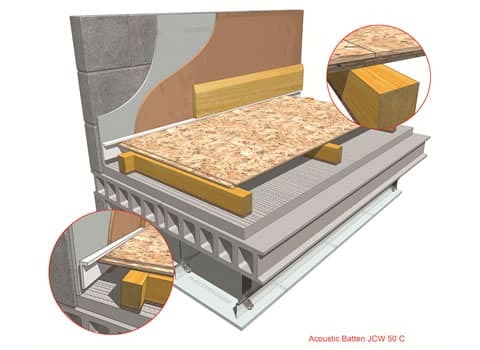 A 5mm (min) resilient flanking strips is required around the perimeter of the flooring board to isolate the floating floor from walls and skirting. FFT3 resilient acoustic battens must have a continuous pre-bonded layer with a minimum height of 45mm.